Why Are Amish Building RVs? Did you know that Amish in one community are heavily involved in building luxury recreational vehicles? According to one source, “more than 80 percent of global RV production is based throughout the region”, the region being northern Indiana. This includes the 3rd-largest Amish community, at Elkhart and Lagrange Counties, along with the sizeable next-door Nappanee settlement. While that 80%-plus feels like it could be a bit high, the importance of the industry is clear to the eye as you drive around the several counties which comprise the Amish area. Here you’ll find factories of such major producers as Jayco, Forest River, and Newmar. The local Amish economy to a great extent flourishes or suffers based on the fortunes of the industry. In fact, a majority of Amish under age 65 work in RV plants in the area. This dependence sometimes leads to painful times – in 2009 in the midst of the recession and Americans cutting back hard on luxury purchases, Elkhart and Lagrange Counties had one of the nation’s highest unemployment rates – near a whopping 20%. Those concerns related to 1) money (an overabundance of spending cash), 2) unsavory work environments, and 3) the stress of fast-paced factory line production (and I probably could have added this heavy reliance on a single industry as its own fourth concern). Factory work is quite different, with its fast pace and “unAmish” environment, from the traditional farm vocations we associate with the Amish (and for that matter, dairy farms are noticeably rarer here than in a place like Lancaster County). So why have the local Amish been heavily involved in building luxury vacation vehicles for many decades now? Allison Yates looked at this question recently in an article for Atlas Obscura. In the article, Steven Nolt from the Young Center shares some insights on how this came to be – along with comments from some local Amish (plus a few words from yours truly). 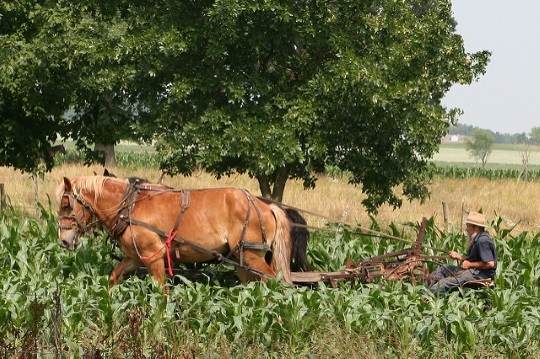 So just what does an Amish factory worker’s day look like – and how much can you make? Year-round, Amish men go into work at 4:00-5:00am, riding into town in a bike or buggy, and working until they complete their day’s quota. The faster they work, the sooner they go home. In Newmar’s Nappanee factory, for example, once workers finish eight RVs, they’re done for the day. Some might not even have to work a full eight-hour day, and wages are relatively high—reported to be around $4,000 a month and up. To add a few more observations, a couple of our commenters recently weighed in on my original post with some insights. An Amish farmer in central Indiana. Farming was a minority occupation for northern Indiana Amish even by the late 1980s (see Plain Diversity: Amish Cultures and Identities, pp. 85-87 for more). The RV industry is booming again in northern Indiana, as are the manufactured homes, but I’m not sure how it compares to the past since I’m no longer involved in it…Many younger Amish moved away when things slowed down, but appear to be coming back now. The Amish schools are bursting​, and another large one was built a few miles from me. I’m seeing more of the Amish pleasure riding horses again, and many more signs of affluence. 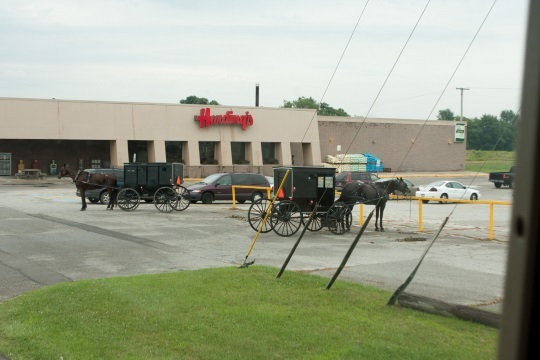 The implication in Al’s summary of the Amish and Menno-Hof articles is that Amish had lost some connection to the land, as well as lost some focus on family and community, due to dependence on RV factories. Do those two things automatically go hand-in-hand with RV work? I agree with Al that more current perspective on how those values are being sustained today would be interesting. The RV industry is deeply woven in the northern Indiana Amish economy. I once speculated that local Amish would shift away from being dependent on RV jobs following the pain of the late 2000s recession years. Some did open businesses, but the industry is so ingrained in the community that when things look up again it’s easy to return to the factories, even if you have ambitions of a home enterprise. RV work is its own tradition in this community, just as farming or woodworking is in others, and it looks like even large and painful unemployment shocks won’t do much to shake that. 4 responses to Why Are Amish Building RVs? It is a business opportunity, and as long as non-Amish need or want such things, the Amish might as well build them for us. Many people do things for others: it does not mean they are required to use them. I would trust the workmanship of an Amish person and be glad for the product! I for example am a vegetarian. If I treat a friend to dinner and he orders a steak, I can wish him Guten Appetit and sincerely hope he enjoys it. I am not an activist, and we are fine, I with my salad, he with his steak. I do not force my salad or Brussels sprouts (I love those in butter!!!) on anyone, and I expect his steak will not wander onto my plate! I just want to point out I do not begrudge the Amish for working in the RV industry, nor would I feel myself in a position to make any sort of judgment like that, for that matter. As Ola Yoder points out in the article there are positives to it and obviously it allows the Amish support families. Spending 3 months in northern Indiana in 2006 talking to a dozen or more RV workers every day, I just seemed to hear the same stories about factory work drawbacks over and over again (which I detailed in the original “3 concerns” post linked above). But it’s important to remember the pluses as well. Another point made by you – many people create things for others which they don’t use themselves. This includes the many Amish who build luxury homes, high-end furniture, and as in this case, RVs (though I think we can find exceptions in each of these cases). It could be argued that the Amish have an unfair advantage because they don’t pay social security and or workmans comp taxes. Leave a reply to Why Are Amish Building RVs?